So, it's easy enough to glider proof a bathroom with a wipedown & a towel under the door, but what about the rest of the house? I'm about to move Delta into a proper cage with great big doors & want to be prepared for an escape. And I would like to be able to stand calmly if he escapes rather than chase him, hopefully boosting the bonding process. Outlet covers are a no-brainer, general cleanliness is a must, there's never any accessible food - I despise bugs - & I've learned to keep my toilet lid closed & have retired my little water fountain. But what about the space between the wall & the fridge, the wall & the stove, etc? And I have a couple mouse holes, but at least I know where they are because I caught & released when I got mice. But I feel like anything I could stuff into those holes, he could just pull out. And of course I'm sure I have some glaring oversight that I'm not thinking of. General glider-proofing advice? There is not much you can do to seal spaces under or behind appliances - just do your best to keep your glider out of the kitchen and laundry room. The mouse holes must be sealed - you can get drywall patch kits at Lowe's or Home Depot - or at the very minimum DUCT TAPE will close them. She found that the top of the metal post supporting the glass shower walls was OPEN at the top and not completely covered by the top rail that supported the sliding shower doors. After catching her trying to crawl into the post I stuffed a washcloth tightly into the space. She once found the space under a pocket door and managed to crawl through a support bracket with an opening 3/4 inch high and 1 1/2 inches wide to get into the wall. I was prepared to punch a hole in the wall to get her out but was successful in coaxing her back down to the floor and getting her to squeeze back through the bracket - good thing I had meal worms handy to get her to come out. I used 2 of the long perches that came with the cage to slide into the bracket to prevent her from going in again. Bonus was that I could slide the perches out when I closed that bathroom door and they also filled the space under the door during playtime better than the towel that she had pulled away to get under the door in the first place. She also found spaces underneath the bathroom cabinet units near the floor (feel under all cabinets for open spaces). My cabinets also had a gap under the counter top that she found tempting. I covered the gap with duct tape and eventually just gave in and replaced the cabinets in that bathroom all together. Also check under furniture including box springs for any opening of the lining underneath. 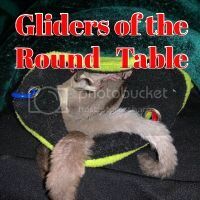 Gliders can get under couch cushions as well if they are out without supervision. Best thing is to be sure to secure all cage doors - especially any small slide up doors to prevent escapes. When you do have your glider out try to confine them to one room. My gliders all love treats and will usually come to me quickly if I shake the small container I keep yogies or pine nuts in.